Mortgage-backed securities have rather odd characteristics compared to Treasuries. At their most basic level, mortgages are bonds—prices are inversely related to yields. The pricing on mortgages assumes a certain level of refinancing activity. However, when yields rise, expected mortgage duration tends to extend because mortgage holders are less likely to refinance. When yields fall, expected duration shortens as mortgage holders replace their existing mortgages with new ones at lower rates. Usually, mortgage bonds tend to act like options; they act “normal” within a certain range of yields, but duration adjustments occur if yields change above a given range. Some bond fund managers are required to maintain a given duration level. If the manager is holding mortgages and refinancing activity rises then the fund’s duration could shorten. This would require the manager to take steps to re-extend duration. A fast way to accomplish this goal would be to buy long-duration Treasury futures. These instruments are liquid and generally have a set duration. In general, refinancing tends to take place when interest rates fall below the level of the current mortgage, taking closing costs into account. The chart on the left shows the 10-year T-note yield; we have regressed a time trend through the data. Clearly, yields have been on a downward path since 1990. The chart on the right shows the 10-year T-note yield less trend on the lower line and the mortgage refinancing index on the upper line. Evidently, refinancing activity tends to rise when rates are below trend. 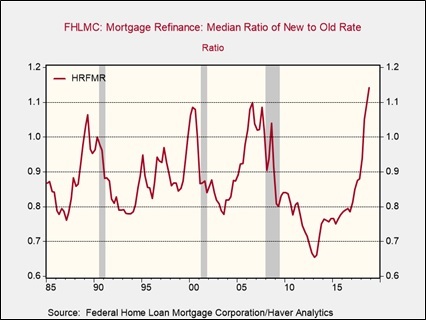 Since 2016, the steady rise in rates relative to trend has depressed refinancing. However, we have seen a lift in refinancing recently. On the one hand, the dip in rates doesn’t look like enough to overcome closing costs. On the other hand, paying a higher rate on a new mortgage may be the only way a homeowner can capture price appreciation. 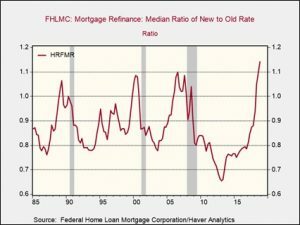 This chart shows the ratio of the new rate to the old rate. When the old rate is higher than the new rate, the ratio is less than 1.0. Note that this ratio is now at a new record high. Essentially, buyers are refinancing at a less advantageous rate to extract home equity. We suspect the most important factors of the recent bond rally have been changes in monetary policy expectations and reduced inflation fears. But, the rise in refinancing has likely played a role as well. We doubt that the attractiveness of locking in a higher mortgage rate will continue indefinitely, therefore this bullish factor should dissipate in the coming weeks.